I had the September Beverly’s coupon burning a hole in my purse, so I went just to look this morning. 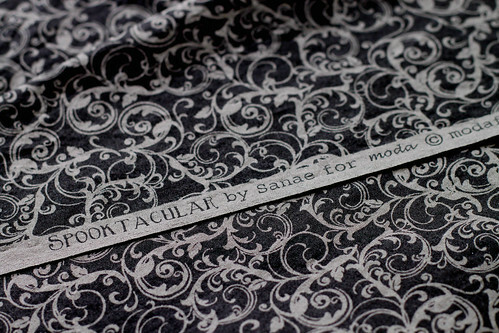 The photo shows the fabric I bought, which looks lighter than the fabric really is. The grey is much darker, but this way you can see the pattern better. Won’t it make a great Halloween shirt that can be worn for more than just Halloween? Moda cotton fabric is so soft, much nicer than most quilting fabric. I hope to go the Disneyland around Halloween, or in November. I love when the Haunted Mansion changes over to “The Nightmare Before Christmas.” Now I will have something special to wear. This entry was posted on Wednesday, September 30th, 2009 at 3:00 am and is filed under Sewing. Tagged: Sewing. You can feed this entry. You can leave a response, or trackback from your own site. I can’t wait to see it! Knowing you it’ll be done by the weekend. I never knew Disney did that, I wonder if they do it here in Florida?